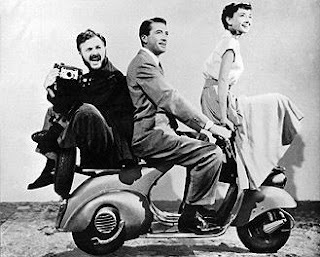 Like the breezy feeling of driving around the Roman Portico on a Vespa, such is the experience of watching Roman Holiday, the delightful romantic comedy and screen debut of Audrey Hepburn, as well as the accidental advertising campaign for Vespa scooters. Miss Hepburn, in her first major screen role at the age of 24, plays Princess Ann, a royal from an unspecified country, likely patterned after the then youthful princess Elizabeth II, who was inaugurated as the Queen the year before. Ann has come to Rome on an official visit, which means endless days of bows, curtsies, pomp and ceremony. As she watches the vivacious energy of the common people in the streets, she desperately yearns to experience the city in that way. The night before she’s due to leave Rome she escapes from the room and lands herself in the middle of the city at night. Sleepy-headed and thus out of sorts, she falls into the company of a handsome journalist, Joe Bradley (Gregory Peck), and winds up sleeping on his couch. The next morning, Joe and Princess Ann gallivant around the city riding Vespas, getting her hair done, sight-seeing, etc. Only Joe knows it’s actually the Princess and hides the fact that he’s a journalist in order to get an exclusive story. Even though they fall in love, the Princess’s royal duties prevent her from being with Joe. But not before Princess Ann admonishes her affection for him in a coy speech to the press in the film’s finale. Roman Holiday feels like a template film for modern romantic comedies – specifically Notting Hill and virtually every romcom made by Garry Marshall. Despite being a royal of privilege and wealth, Hepburn’s character is written as a porcelain doll, unable to experience the real joys in life – only the fake, manufactured life of being a public figure to be gawked at like an ornament on a mantelpiece. Thus, the audience feels empowered to see the upper class in a position of superiority. But it’s really fairytale stuff, a reverse Cinderella/Pygmalion story, which isn’t all that original in the first place. Conflict is kept to a minimum for the most part, as Joe is never really taken to task for his deception of Ann. There are also some laughable lapses in cinema logic – specifically the idea that the Princess can walk around Rome unnoticed; or even that by cutting her hair she would be rendered completely invisible. But there’s no such thing as common sense in cinema, as long as it fits into the formalized structure of the genre. And this screenplay is crafted to genre perfection. The screenplay, written by then blacklisted Dalton Trumbo, who couldn’t take credit for the work, was originally packaged for Elizabeth Taylor and Cary Grant. When Hepburn replaced Taylor, Grant bowed out for fear of being upstaged by the meatier role and Hepburn’s innate onscreen charm. Peck admirably shares the screen and the starring credit, furthering his reputation as a Hollywood nice guy. Hepburn even won an Oscar for her work. In 1953, the on-location setting was new and fresh, and even with today’s eyes Rome in the 1950s is rendered impossibly romantic. And with Peck and Hepburn searing the screen, it justly remains a classic today – a dreamy romantic comedy par excellence.